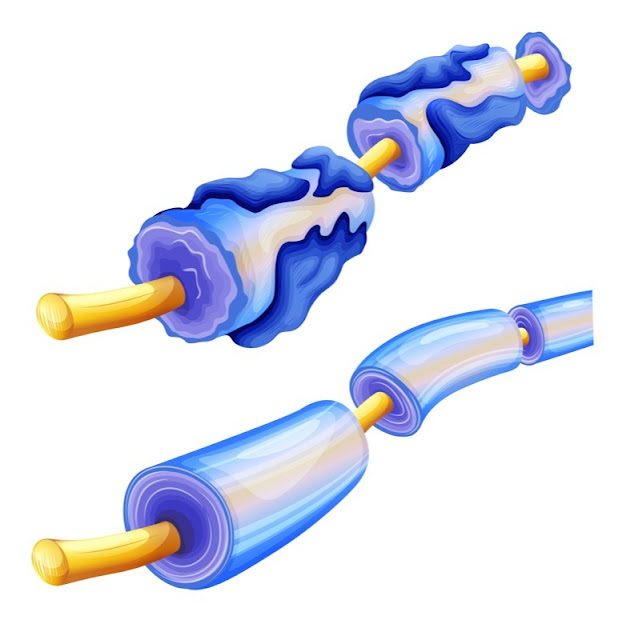 Remyelination at the moment is the buzzword to beat all buzzwords in the world of research into, and treatment for, the vicious disease that is multiple sclerosis. Now, as you are reading this, you must have some knowledge of MS and are sure to know about the link between the loss of the myelin sheath and MS; that is why I am not going to repeat that here. But the reason remyelination is making the headlines is that there is so much going on. Earlier this year, researchers from the University of Cambridge showed that a membrane-bound signaling protein, EphrinB3, blocks the remyelination of damaged neurons in multiple sclerosis (MS). The study, “Antibody-mediated neutralization of myelin-associated EphrinB3 accelerates CNS re-myelination,” uncovered a new target to explore in the search for a new MS treatment. Next, during a Phase 2 clinical trial testing the efficacy of a common antihistamine, clemastine fumarate, to treat optic nerve damage in people with multiple sclerosis, the drug was able to slightly reverse damage to their visual system. The study, conducted by researchers at the Multiple Sclerosis Center at the University of California San Francisco, and titled “Positive phase II double-blind randomized placebo-controlled crossover trial of clemastine fumarate for remyelination of chronic optic neuropathy in MS,” was presented on April 19 by Dr. Ari Green, a study author, at the 68th American Academy of Neurology (AAN) Annual Meeting that took place in Vancouver, Canada, through April 21. Third on the list, a substance called fluorosamine was seen to boost remyelination in mice by preventing the synthesis of chondroitin sulfate proteoglycans and by promoting oligodendrocyte function. The findings showed that targeting molecules that block remyelination may be a promising therapeutic approach in multiple sclerosis. Similarly, fingolimod (Gilenya), a drug approved for patients with relapsing multiple sclerosis to prevent neuroinflammation, may also help these patients by directly enhancing nerve regeneration and increasing myelination in a way that is partly independent of its anti-inflammatory properties. The study reporting this finding, “Fingolimod promotes peripheral nerve regeneration via modulation of lysophospholipid signaling,” was developed by researchers at the Medical Faculty, Heinrich-Heine-University, in Germany, and published in the Journal of Neuroinflammation. Most recently, Endece was recently issued an additional U.S. patent for its lead investigational product NDC-1308, being developed to induce remyelination in patients with multiple sclerosis and prevent disease progression. Now in late preclinical development, NDC-1308 is designed to repair the myelin sheath of demyelinated nerve fibers. The therapy is specifically targeted to heal motor neuron damage, and is intended for use either by itself or in combination with other disease-modifying agents to slow progression. With the immune system’s attacks on the nerves’ myelin sheaths being such a key part of MS, it is easy to see why remyelination attracts so much interest. It’s great to see such promising results of research and early stage development, but they are not enough. Let’s get on and find a way to make them work in patients. We need treatments now, not in 10 or more years time.